SikhNet opposes Sikhs, Sikh Rehit Maryada & Akal Takhat on Interfaith Anand Karaj ! To even the most casual observer it has been obvious for some time that the Yogi Bhajan cult – 3HO, Sikh Dharma International and SikhNet – has the goal of imposing their own brand of Bhajanism on the larger Panth. SikhNet is the most visible of these entities and the most propaganda oriented. Last week the kiddies at Sikhnet showed their true intentions by publishing two articles supporting Anand Karaj for people who are not Sikhs. This has become quite the topic of late as the Akal Takhat recently re-affirmed that Sikh Rehit Maryada does not allow people who are not Sikhs to be married by Anand Karaj. Further, on October 25th, the Sikh Council (UK) released their Guidelines for Consistent Approach to Anand Karaj for British Gurdwaras which also reaffirms that interfaith marriage cannot be performed with the Anand karaj ceremony. This position has been overwhelmingly supported by the majority of the Panth. However there is a small but increasingly vocal minority who want to cheapen the Anand karaj ceremony by extending it to anyone who wants to marry a Sikh, whether they believe in Sikhi and Gurbani or not. And there is the crux of the whole problem. We cannot fault this girl for taking these steps to make her husband happy; in fact her actions are highly commendable. What we have to ask is why was there no one in the Canterbury Sangat who took steps to make sure that the girl knew that – if she wanted to get married by Anand karaj ceremony – she would have to become a Sikh. What about the Granthi Singh and the Ragi Singhs who must have participated in the ceremony? Did they have nothing to say? Don’t they know the Rehit? This sounds good but it deliberately skirts the most important issue in the whole discussion. 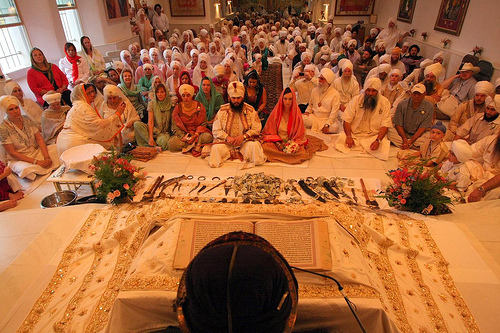 That – in order to participate in Anand Karaj – people should not only UNDERSTAND Sikhi, but they should PRACTICE Sikhi and affirm themselves as Sikhs. They cite the part of the Sikh Rehit Maryada which says “A Sikh man and woman should enter wedlock without giving thought to the prospective spouse’s caste and descent”. But there is a reason for this. It has to do with the extreme prejudice of the caste system in India and the Guru Sahiban’s preaching against caste. It’s very clear that any person of any caste or race can be a Sikh. And a true Sikh should not be bothered by these things. But, when it comes to religion, if a person who is not a Sikh is married in Aanand Karaj, they do not believe in the principles and tenets of the ceremony. Therefore, what use is it? And, if they want to believe, how hard it is to become a Sikh? If an interfaith couple, one of whom is a Sikh wish to come to gurdwara to have their union blessed, they can. There can be kirtan and ardas and no one will object. Even a couple, neither of whom is a Sikh, could come to gurdwara to have their union blessed. That is the inclusive nature of Sikhi. So it seems that Sikhnet is making it clear that they are part of the movement to remake Sikhi in the image of Bhajanism by standing against the Akal Takhat and Sikh Rehit Maryada. “The message of Gurbani is universal and the Sikh institution of the gurdwara is inclusive. However, over the centuries a corporate dimension of Sikh ideology and identity has emerged to defend the faith and the faithful. Great sacrifices have been called for and made. Compromising the corporate aspects of Sikh religion is a slippery slope leading to the loss of ideological independence, and visible identity of the religion. The family unit is central to the preservation of the ideology and identity of an established world religion like Sikhi(sm). One has to ask why Sikhnet has changed their stance to a position that is clearly against the Akal Takhat and Sikh Rehit Maryada?